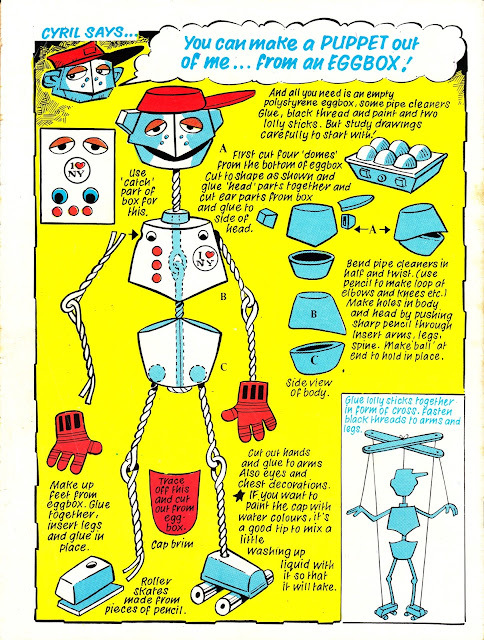 To celebrate the belated return of Marvel's Editor Droid to the posts of STARLOGGED, here's a little project for the weekend: build your own CYRIL puppet. Yup, by September 1984, Marvel UK were already chasing younger readers by adding a weekly activity page' to RETURN OF THE JEDI weekly. It was a feature better suited to SCOOBY-DOO, THE GET ALONG GANG or - shudder - THE SPIDER-MAN COMIC. Fortunately, the feature was phased-out over time. Not least because it took up a valuable page once the comic settled into its final 24-page format. This appeared in issue 64, cover-dated 8 September 1984. Play safe with scissors star warriors!